Center for Hospice Care (CHC) is pleased to announce that the 32nd Annual Walk for Hospice will be held on August 12, 2017. 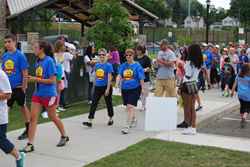 Center for Hospice Care (CHC) is pleased to announce that the 32nd Annual Walk for Hospice will be held on August 12, 2017. CHC will again have the Heroes for Hospice Fun 5K followed by the Walk. This is an uplifting, family-friendly event that takes place on Center for Hospice Care's Mishawaka Campus, Central Park and along the Mishawaka Riverwalk. This year's event will feature a memory wall, food, games, costumes and even the motorcycle from the movie "Ghost Rider." Free registration begins at 9:30am. The 5k begins at 10:30am, followed by the Walk that begins at 11:00am. For more information or to pre-register please visit walkmichianaforhospice.org. Established in 1978, Center for Hospice Care is an independent, community-based, not-for-profit organization, improving the quality of living through hospice, home health, grief counseling, and community education. With offices in South Bend, Plymouth, Elkhart and Mishawaka, CHC serves Elkhart, Fulton, Kosciusko, LaGrange, LaPorte, Marshall, Porter, St. Joseph and Starke counties in Northern Indiana. The Hospice Foundation is committed to supporting the work of CHC through community outreach and education, fundraising activities and other special events. The Foundation helps CHC keep its 37-year promise that no one eligible for hospice services will be turned away, regardless of their ability to pay.